In the Autumn of 2013, Lisa Staniford and Mairead Cheeseman saw an advert for a soft play group called Little Scamps up for sale. They were very excited and wanted to buy the business. They asked me, Pauline (Mairead’s mum) to help them fund the purchase. I immediately agreed and so on the 29th October, our adventure began and we reopened Little Scamps for our first soft play session. After much discussion and many ideas we decided to change the name to Little Rays to establish our own identity, but we also thought it sounded better as each of our children are little rays of sunshine that brightens even our cloudiest day. In September 2014 we opened the Breakfast and After School clubs at The Bury’s Scout Hut, the clubs grew very quickly and we soon out grew our little HQ. So after searching high and low, we decided to move our Out of School Clubs to the Godalming Town Football Club in March 2015. We were delighted with the sheer amount of space the football club offered and had so many ideas to how to use it. That year we approached the committee for permission to start a pre-school once we had our Ofsted registration. The Football Club have backed us and helped us all the way and in September 2015, Little Rays Outdoor Learning Pre-school officially opened its doors! We are so proud of our achievements but this is just the beginning. In July 2015, Andy Redfern joined us from Australia and has taken over the management of Little Rays Soft Play and has expanded to the Wilfred Noyce Centre in the heart of Godalming. Now that has happened I can concentrate on growing our lovely Pre-School, continuing to train our fabulous staff to reach higher qualification levels, and of course to expand our Forest School sessions in the Loseley Park Nature Reserve near Watts Gallery in Compton, Surrey. We hope this has given you a brief insight into our little venture and hope you can join us at one of our many clubs, soft play sessions or pre-school activities. In 2013 I was accosted by my daughter Mairead Cheeseman and her friend Lisa Staniford to help them buy a small soft play group called Little Scamps, to help keep this fantastic little playgroup alive in Godalming, which I did. We later changed the name to Little Rays and started running mother, baby and toddler sessions at The Scout Hut. Lisa and Mairead both had young children so I helped out at the sessions, during this time Lisa was unwell. She was sadly diagnosed with an aggressive Breast Cancer, which had spread to her spine and liver. So I stepped in to cover for her during her treatment. Lisa popped in to see us at soft play when she wasn’t at the hospital or at home. 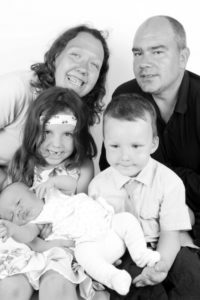 She never complained, she just got on with raising her 3 children Emiley, Bradley and Rosie, as well as running and organising many fund raising events for Cancer research and MacMillan. She also started a petition and campaign for a reduction in age for Breast Screening, something she had been refused as she was so young and may have prevented her illness had it been diagnosed earlier. She talked frankly about her condition but never once excepting it. Appearing on Eagle Radio, asking people to sign her petition, which thousands did. Lisa put up a tremendous fight for herself, husband, children, her family and friends, but it was sadly lost on 14th November 2014. Her funeral had to be moved from her local church in Busbridge to Godalming to accommodate all the people who wanted to say there goodbyes and thank her for all she had done for them and her community. She started Busy Bees play group for mothers and babies at Aaron’s Hill, she encouraged everyone she met to come along for a cup of tea and a chat, and could Lisa chat! Everybody misses her bubbly kind personality, along with the biggest smile that will never fade. Little Rays has grown and gone from strength to strength, with Lisa and her family in our thoughts at every stage as we develop as she would have wanted us to, to help secure her children’s future. Lisa, we miss you everyday, but see you in your children. Little Rays will always be a legacy to you. Thank you for seeing a vision, and all of us at Little Rays will make sure it stays the best it can be.